The specialized functions of the CPU, Soundcard, video display, serial interface, etc. found in a traditional 1990s PC are replaced by a number of In-Situ Programmable devices (ISP CPLDs). 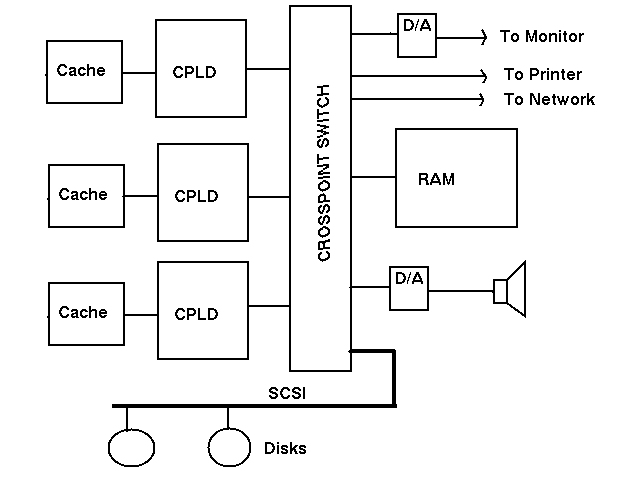 A crosspoint switch allows simultaneous interconnections of CPLDs to external ports. While a particular CPLD might be dedicated to a particular function for a majority of the time, it might be reassigned if required. For example, to perform a heavy task such as finite element analysis, the devices normally used to provide video and sound might be borrowed to provide extra processing power. The CPLDs are programmed in a language such as VHDL which supports hardware definition to the gate level, or more probably a higher-level object-oriented language capable of compiling software objects into separate hardware elements operating in parallel. Any combination of processing and storage elements is possible, allowing the synthesis of custom hardware to address sny problem. Pipelined and parallel algorithms allow dozens or hundreds of operations to proceed in parallel. Extra power may be obtained by adding extra CPLD elements. The width and number of ports on the crosspoint switch limits the possible expansion. One of the devices must remain programmed with sufficient functionality to boot the computer. Either a non-volatile technology may be used, or a traditional CPU can be used to boot the machine.